LGR made a video of version 7 and goes much more in depth. I was able to find a 5.0 version and will share some screenshots of that. 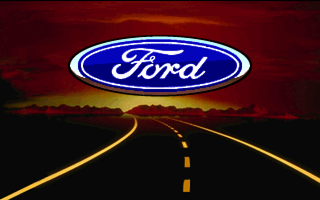 Basically Ford provided customers and potential customers of software that ran on MS-DOS and provided a virtual showroom of their models.. There was even a basic driving sim but it got boring really quickly. More on that later. Driving simulator. Basic... just choose a Ford, arrow keys to steer/accel/brake. Space to shift gears if you choose a manual car.